a) When AR < AC but AR is still greater than AVC. 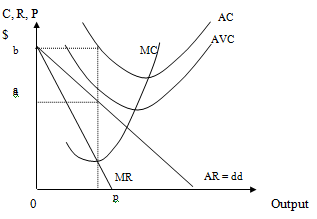 b) When AR < AC as well as AVC. Since there are barriers to entry and no rival firms in the industry, monopolist is able to continue with its supernormal, normal or subnormal profit in the long run. Therefore, there is no difference between the monopolist's short-run and long run equilibrium positions. 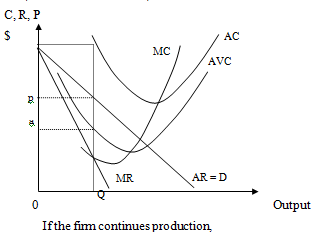 Are you searching economics tutor for help with Shut-Down Situations of Monopoly in Short-Run questions? Shut-Down Situations of Monopoly in Short-Run topic is not easier to learn without external help? We at www.tutorsglobe.com offer finest service of economics homework help and economics homework help. Live tutors are available for 24x7 hours helping students in their Shut-Down Situations of Monopoly in Short-Run related problems. We provide step by step Shut-Down Situations of Monopoly in Short-Run question's answers with 100% plagiarism free content. We prepare quality content and notes for Shut-Down Situations of Monopoly in Short-Run topic under economics theory and study material. These are avail for subscribed users and they can get advantages anytime.